Kingsman: The Golden Circle opened today to love it or hate it reviews. In short if you like the first movie you will like this one, if you hated or didn’t see the first movie, you probably won’t see this one. For me, it lacks the originality and some of the fun of the original movie, but is still enjoyable. But we aren’t here to review the movie, we are here to talk about drinks in movies. He adds ice to a mixer, puts a splash of vermouth and stirs. Tips the vermouth away and adds Berry Bros. & Rudd No. 3 London Dry Gin. He stirs it slowly for about a minute and serves in two martini glasses without a garnish. Three parts Bombay Original London Dry Gin; one part Stolichnaya vodka and a small dash of Noilly Prat dry vermouth. Shake or stir until very cold. Works with a slice of lemon peel or a couple of pimento olives as a garnish. A conversation about the recent movie Ghost in the Shell got me thinking about Robert Rodriguez’s adaptation of Yukito Kishiro’s manga; Battle Angel Alita that I heard about last year. It appears we have more than a year to go until the release of Alita: Battle Angel next July. I am intrigued by the idea of the master of low budget independent genre movies making a $200 million film produced by the king of excess James Cameron. In checking on the release date for that movie I spotted a film directed by Rodriguez that I knew nothing about. Surprised that a Robert Rodriguez film had come out totally under my radar I checked the release information; released on 18 November 2015 and only in France, I did a double take, the release date was actually listed as 18 November 2115. I looked further, the IMDB synopsis reads: “The content of this film is currently a secret, due to be revealed only when the title is released in 2115.” The film is stored in a safe with a time lock set to open in 2015. It appears the film made in 2015 by Rodriguez was commissioned by Rémy Martin owner of the Louis XIII Cognac brand. As mentioned above there is no clue about plot. After a quick hunt around the internet, I have no idea what the film is about, how long it is how it is going to be preserved for 100 years. Although nothing definitive there are a few clues. A line from an interview with star John Malkovich suggests it will be “a short film”. There are three trailers, they however don’t actually show any footage from the film, just imagine how the world will look when the safe opens. The trailers suggest that it will be stored on film in a tin, the way many believe is still the best way to preserve film. Although this could just be for the aesthetic of the trailer. The somewhat mundane thing of how the film will be preserved and viewed is what interests me the most about the project. If I wanted to ensure a classic film, lets for augments sake say Casablanca (not quite 100 years old, it actually celebrates its 75 anniversary, this year) is kept safe for future generations, how would I do it. In the documentary Side by Side (2012) Martin Scorseese talks about film, whether it be old celluloid film or modern polyester film stock being the best way to preserve films. As mentioned if you leave a hard drive un-booted for a prolonged period, it won’t work. It is worth mentioning at this point, that Scorseese is the founder of The Film Foundation, an American based non-profit organization dedicated to film preservation as well as the exhibition of restored classic films. As also mentioned in Side by Side, I believe diversity is the way to go. If a film is stored on several types of film, including in print and negative form as well as digitally, it stands the best chance of survival. As well as an archive that may hold prints or masters of Casablanca, it must be held in various formats by TV companies and distributers who have sold it in one format or another, as well as all the versions people have at home on VHS, Laser Disc, DVD and Bluray. All this suggests the film will survive, it doesn’t answer the question, how do you preserve a film in a safe for 100 years. Are there backup copies? Does Robert Rodriguez have a copy that he throws on for a secret screening when his friends come around? We don’t know who has seen it but we have an idea of who will see it; Rémy Martin have produced One thousand tickets/invitations, made of metal to ensure they survive the 100 years. Recipients are encouraged to pass these tickets to their decedents. It isn’t clear who these recipients are but they certainly include Malkovich and Rodriguez. What will happen to the tickets, will people keep them and lovingly pass them on, or will they be forgotten. Will it be the hottest ticket in France in 2015 with people auctioning their ticket to the highest bidder? How much will cinema have changed in 100 years. It is impossible to say, but we can see how much or how little it has changed in the last 100. Two significant films of 2015 are: The Birth of a Nation (1915) by D.W. Griffith and Les vampires (1915) by Louis Feuillade. Two films both extremely dated and surprisingly modern in certain ways. I am more intrigued wondering who has actually seen the film what it is actually about! And if you are wondering, I won’t be drinking any Louis XIII cognac, I don’t particularly like brandy and there is the small matter of the £2,500 a bottle price tag. Yet another Bond/Skyfall post, in my defence as a huge fan I write about James Bond all the time, I‘m not jumping on the bandwagon. In a variation on my recurring Drinks in Movies thread I am going to look at the drinks in Skyfall. There are films that are full of nuanced symbolism and metaphors, in other movies what you see is what you get. I could be cracking open the secrets of the film or reading too much into it you decide. Whatever your thoughts, there are lots of spoilers here so don’t read unless you have seen Skyfall. As I have mentioned before Bond drinking a vodka martini is a bit of a cliché that is only partly true. In the Ian Fleming novels Bond invents the Vesper in Casino Royale but drinks various different things but favours Scotch Whisky, no great surprise, his farther is from Glen Coe after all. Around the half way point of the movie Silva (Javier Bardem) gives Bond (Daniel Craig) a glass of his favourite Whisky, a Macallan 1962 Fine and Rare Vintage, he describes it as being a 50 year old. Most likely a reference to the 50th anniversary of Bond rather than the drink itself. So what can we read into this? Silva knows everything about Bond, something thay he prides himself on. We also see M (Judi Dench) drinking the same Brand of whisky, something that I am sure hasn’t escaped Silva’s notice. Does it go deeper? Is it also the Writers (Neal Purvis, Robert Wade and John Logan) or the director (Sam Mendes) telling us they know there character, they aren’t filmmakers for hire, paid to churn out the next Bond film, they know their character inside out. Its one of those great little touches that fans will appreciate but many people won’t notice like giving Bond a midnight blue dinner jacket instead of a black one. 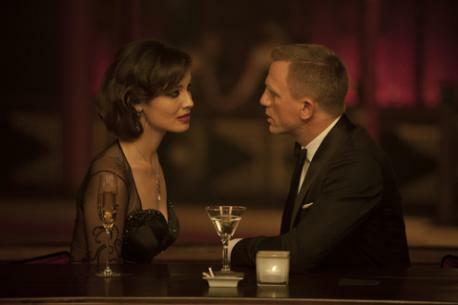 We do see Bond drinking a martini in the Macau casino but we never hear the shaken not stirred line or the Vesper recipe. This is still the Bond we have known for 50 years (longer in the books) and we aren’t going to forget that, but he is moving on. This works in the same way as the exploding pen conversation with Q (Ben Whishaw) being a reminder of the past and a signpost to the future. There has been a lot of fuss over Bond drinking Heineken, this is unfounded as he is no stranger to beer having drunk it many times in the books and films. 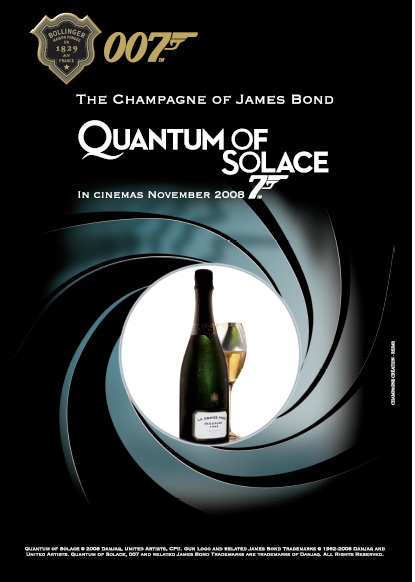 As a product placement Heineken has appeared in several films including Craig’s other two outings as Bond. Product placement is certainly nothing new to Bond, in the books he has drunk more champagne than anything favouring Taittinger. In Cassino Royale he remarks that “[1943 Taittinger] is probably the finest champagne in the world” but a long standing placement deal means he has drunk little but Bollinger since Live and Let Die 1973). I wouldn’t read much into beer or the product placement, but it is worth considering when he drinks it. In the scenes where Bond is “dead” he is living away from his spying world as a broken man, an ordinary man and not the supper hero that Bond has become, beer as the great leveller of men, a memento mori. Gareth Mallory (Ralph Fiennes) pours M (Judi Dench) a glass of cognac, Courvoisier VSOP, this is a gesture seen many times in Bond films where M gives Bond a drink. A possible hint towards Mallory being the new M as he does at the end of the film. It actually goes a stage further than that. In GoldenEye Bond (Pierce Brosnan) meets the new M (Judi Dench’s first appearance) for the first time. 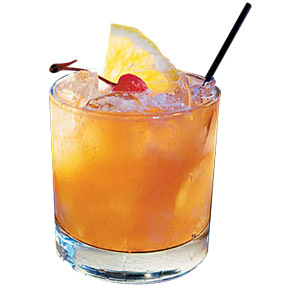 When she offers him a drink he tells her “Your predecessor kept some cognac in the top drawer of…” she tells him that she prefers bourbon (She actually gives him Jack Daniel’s, a Tennessee Whiskey rather than a bourbon, but a common mistake in England). Later in the movie we see Mallory as M in an office more reminiscent of the one inhabited by previous M’s Robert Brown and Bernard Lee than the modern one Dench uses, the office and the return to Brandy could just be a further reference to Bonds past in his 50th year on screen, but it could also be a suggestion of a return to classic Bond of the 60’s. As mentioned I am probably reading too much into this, but next time you watch Skyfall take a look and see what you think. 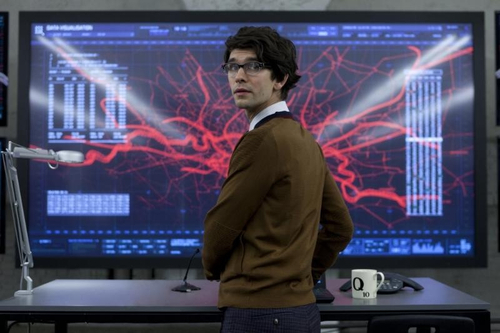 And while you are at it look out for the scrabble score mug Q (Ben Wishaw) drinks his Earl Grey in. Mojito, the perfect summer drink. Notes: Some people also add Angostura bitters, don’t bother doing this. Castor or icing can be used instead of sugar syrup but syrup is best. Traditionally you should use spearmint but any fresh mint will taste good. * To make sugar syrup mix equal quantities of white sugar and boiling water. Stir until all the sugar is dissolved. Allow to cool. This can then be kept covered in the refrigerator for several weeks. The guy in the clip reminds us to enjoy responsibly, this goes more for Mojito’s than other drinks as when mixed properly you won’t taste any alcohol. 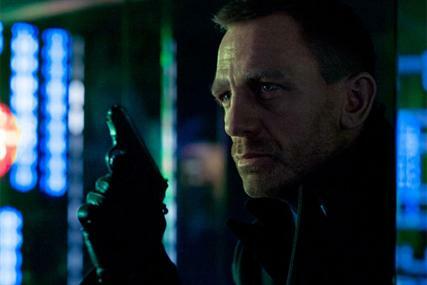 There appears to be a lot of fuss over James Bond drinking Heineken in the upcoming movie Skyfall, what’s the big deal? It isn’t the first time he has drunk beer. Product placement isn’t new to movie in general and certainly isn’t new to Bond. Think of the cars he drives, Bond didn’t give up his Bentley (driven in the books) in favour of various Aston Martin, Lotus and BMW’s for the fun of it. 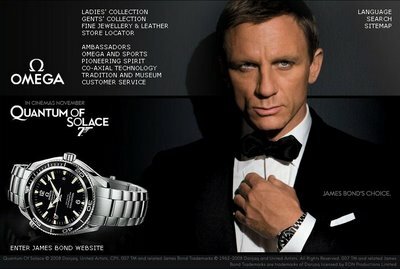 And lets not forget Vesper Lynd’s introduction in Casino Royale where Bond makes it clear that his watch is an Omega not a Rolex (as featured in the books and worn by Sean Connery) . Pierce Brosnan used a Ericsson phone and had a Parker Jotter pen with a handy class-four grenade (I still have one that I won along with a copy of GoldenEye on VHS – mine lacks the grenade). By the time Pierce Brosnan hung up his Walther it is rumoured that as much of half the $140million budget for Die Another Day (2002) came from “marketing partners” this led to the film being nicknamed “Buy Another Day.” Then we have the whole idea of what is sponsorship, United Artists is part of MGM that by the time Daniel Craig took over were owned by Sony. Take a look at the gadgets on display, Sony Vaio laptops, Sony Ericsson mobile phones, Sony Bravia TV’s and Sony Cyber-shot cameras. Looking more specifically at what Bond drinks, this isn’t the first time this has happened. 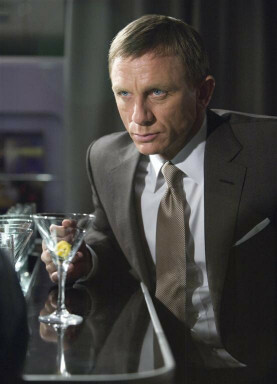 Bond actually drinks more Champagne than anything else including his signature Vodka Martini. The original character in Ian Fleming’s novels favoured Taittinger remarking in Cassino Royale “[1943 Taittinger] is probably the finest champagne in the world”. in the movies, Sean Connery’s Bond appears to have preferred Dom Perignon but some time in the 80’s and ever since thanks to a sponsorship deal Bond started drinking Bollinger. Oh and did I mention bond has had a deal with Heineken before! If you still have a problem, look at it this way, it could be far worse, he could be drinking the tasteless self proclaimed king of beers that is drunk in most Hollywood productions. Shake over ice until it’s ice-cold and strain into a martini glass. My Drinks in movies blog is back thanks to Ross McG who inadvertently reminded me I hadn’t done one lately. And incidentally it has an Irish theme. Intermission (2003) is a black comedy set in Dublin. Those who haven’t seen it, it is painfully funny in places and like all great black comedy you can’t help yourself from laughing even when you know it’s inappropriate. If you haven’t seen it check it out, Colin Farrell and Colm Meaney are both brilliant in it. 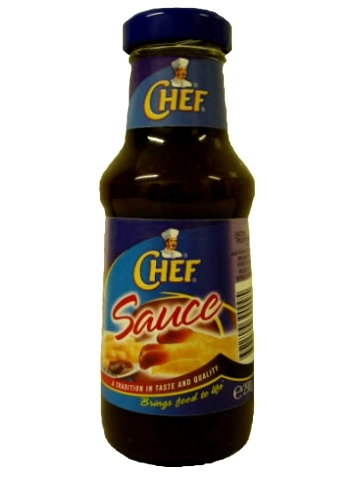 During the movie it is mentioned that John (Cillian Murphy) and Oscar (David Wilmot) stole a case of Chef Sauce (an Irish brand of vinegar based brown sauce a bit like low rent HP) from the supermarket they work in. Having so much of it they were using it in everything just to get rid of it including lacing their tea with it. Sounds discusting but all the characters in the movie who try it think its great. I haven’t tried it myself and don’t intend to, has anyone tried it or is it an invention of the filmmakers? 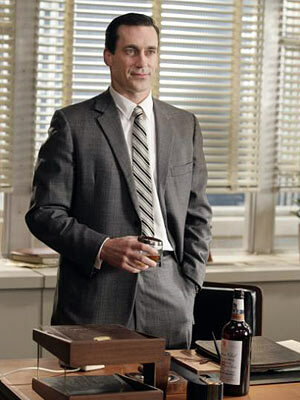 An Old Fashioned is possibly the first drink to be given the moniker “cocktail” and more importantly the preferred drink of Mad Men’s leading man Don Draper (Jon Hamm). How to make: Place a small sugar lump in a 12 tumbler with a little water to dissolve it, add two dashes Angostura bitters , a large thin piece of lemon-peel a cherry and an ice cube. Fill a mixing glass with ice and add two shots of whiskey per serving and stir untilled chilled. Pour into prepared tumbles letting a little of the ice and serve with a slice or orange.